Chickpeas flour, also known as gram flour or besan, is one of the most common and healthiest things found in the Indian kitchen. Chickpeas flour is one of the most popular ingredients in Indian cuisine. The flour is made by milling baby chickpeas a type of legume that has been split and polished also known as chana dal. It is highly nutritious, delicious and is used in both sweet and savoury recipes due to its nutty taste and rich aroma. Apart from being used in preparing dhokla, pakodas and cheelas (pancakes), it is also used in making delicious sweets like motichoor laddoo, besan laddo and besan burfi. Moreover, it can be used as thickener in many recipes, showing how versatile it is. Nutrition profile: Chickpeas flour contains 387 calories per cup. It has 22 milligrams of protein, 11 grams of sugar, 7 grams of fat, 11 grams of fiber and 58 grams of carbohydrates. It is rich in minerals, such as calcium, magnesium, potassium, zinc, phosphorus, manganese, selenium and copper. · If buying a pack, check the seal, date of packing and expiry date. Buy a good branded pack from a trusted store because you cannot check inside the pack unless you open it. · If buying from bins, make sure the bins are not left in open exposed to dust and grime. · Check it to see if it is perfect, free from moisture, damage, insects and stones. · It should be stored in an airtight container. The container should be clean and dry. · It should be kept in a cool, dark and dry place of your kitchen for up to the date of expiry. · Chickpeas flour contains healthy unsaturated fats which help in lowering the cholesterol level of the body. Thus the flour works well for heart health. · Gram flour is wheat free product rich in fiber and nutrients. It makes a healthy and versatile alternative to high carbohydrate wheat flour. Being a rich source of fiber, this flour can ease your digestive system and treat any related disorders. · Besan is found to reduce blood sugar and insulin concentrations as compared to a wheat meal – thereby aiding diabetes treatment. · It contains a good amount of iron that can combat iron deficiency especially for vegetarians who do not get their daily dose of iron from meat. · Being rich in iron, it helps in the production of red blood cells, enhances metabolism and aids in energy production. 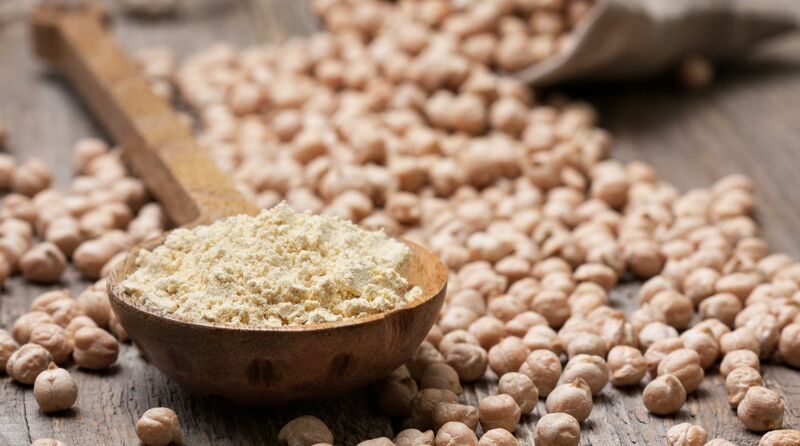 · Chickpeas flour is a rich source of magnesium, a mineral that our body uses along with calcium, to build strong bones. · Magnesium enhances brain health as it makes your brain cell receptors happy. It relaxes the blood vessels and allows more blood flow to the brain. This flour also contains B vitamins and other phytonutrients that boost brain health. · Gram flour is one of the richest sources of vitamin B6 and this nutrient helps in strengthening the immune system. · It is gluten-free, so good to include in the diet for those who are watching their weight. If you have celiac disease or gluten intolerance, you must avoid wheat, barley and rye. Chickpeas flour is a gluten-free substitute of these flours. · Besan contains a third starch called as amylose, a slowly digested starch that helps you feel full for longer. So, again it helps in weight-loss as you eat less. · Although it is not a rich source of most vitamins, it contains vitamin A, niacin, pantothenic acid, vitamin K and folate. · Gram flour aids in protection against colon cancer. It decreases the oxidation of DNA and inhibits the functioning of beta-catenin, an important oncogenic protein in colon cancer. This flour also contains saponins and lignans that help prevent colon cancer. It also contains antioxidants that prevent colon cancer. · Being naturally low in sodium, gram flour helps prevent high blood pressure. · Chickpeas flour helps you in keeping energised as high fiber content in it slows down digestion and this makes sugar to travel much more slowly from your digestive tract to the bloodstream. This leads to lower sugar spike after eating and thus you would not experience fatigue. · Besan is popularly used in facial beauty packs: Make a brilliant face pack by combining three parts of besan and one part of turmeric. Add a teaspoon each of lemon juice and raw honey. Mix well and apply this mask to your damp face and neck. Leave for 10 minutes and wash with warm water. To remove skin tan, mix well one teaspoon each of lemon juice and curd and four teaspoons of besan. Apply this mask on your face and let it dry, then rinse with cold water. To exfoliate dead skin, mix equal quantities of besan and ground oats. Add little sugar say half teaspoon. Add raw milk to make a thick paste. Scrub gently in circular motion. It will remove extra sebum, all dirt and dead skin cells. For skin whitening, mix four parts of besan with one part of orange peel and one teaspoon of fresh malai. Apply this mask all over your face and leave for half an hour. Rinse with cool water. · Being a rich source of protein, besan is a potent hair pack made by combining it with almond powder, coconut oil and curd. This pack is good for nourishing scalp and hair growth. Chickpeas flour offers incredible benefits to the body – so hearty, filling and delicious. Overall it is simply amazing!